Hokay, so the way Intel develops chips is on what it calls the "tick-tock cycle". The "tick" is the improvement of its current microarchitecture, mainly shrinking it down to make it more energy efficient, along with other tweaks. As you now can guess, the "tock" indicates the launch of a totally new microarchitecture. Giz Explains: What&apos;s the F is a Penryn? The ancient front-side bus setup has long been a drag on Intel's chips, and they're finally ditching it. The FSB essentially carried data between the CPU and memory controller hub (which is also out the window, more on that in a sec), but that didn't work so well when you started talking buckets of cores. In its place is a new tech called QuickPath Interconnect that'll make the old bottlenecks history and running tons of cores even better. QPI uses direct point-to-point connections that have a bandwidth of about 25GB/s, way faster than what FSB could offer. The downside is that it requires a new QPI-friendly motherboard. This concept is kind of cribbed from AMD, whose HyperTransport has been doing something similar for a longass time. You might notice a pattern that a lot of Nehalem's performance boosts have to do with better access to memory and fatter bandwidth. Yet another tech that AMD held over Intel's head for years is an integrated memory controller, which Core i7 finally uses. Basically this just means that the memory controller is on the same die as the CPU, cutting down memory latency. Before, with Intel chips, communication had to take place across the front-side bus, making stuff slooooow. The last memory bonus is that Core i7 supports triple-channel memory. Right now, you're probably on a computer using dual-channel memory (in English, I mean that it uses RAM sticks in sets of two). Core i7 will make three sticks of RAM the new standard—so keep an eye out for plenty of 6GB and 12GB systems running around. Intel abandoned Hyper-Threading after the Pentium 4, but it's back in Core i7 (and Atom, but really, psh). Basically, it's a parallel-processing tech that runs multiple threads simultaneously. In English, it divvies up tasks so they can be crunched by a processor simultaneously, instead of one after the other. It short, it makes video encoding and other parallel-friendly processes run faster. We're interested to see what kind of gains this will produce in tandem with programs coded to take advantage of threading, not to mention the next great operating systems, Snow Leopard and Windows 7, which will supposedly make better use of multiple cores and parallel processing than current OSes. Core i7 is pretty much a beast already, but whereas Intel used to say that overclocking was bad for your processor, now with the Core i7, it's built right in. The Core i7 is really aggressive with power management, more so than Core 2, so it'll sip juice when it's not busy, and then crank the power when it needs it. In the BIOS now, you can set it to overclock the CPU in certain situations, and customize that by thermal ratings so it won't overheat. 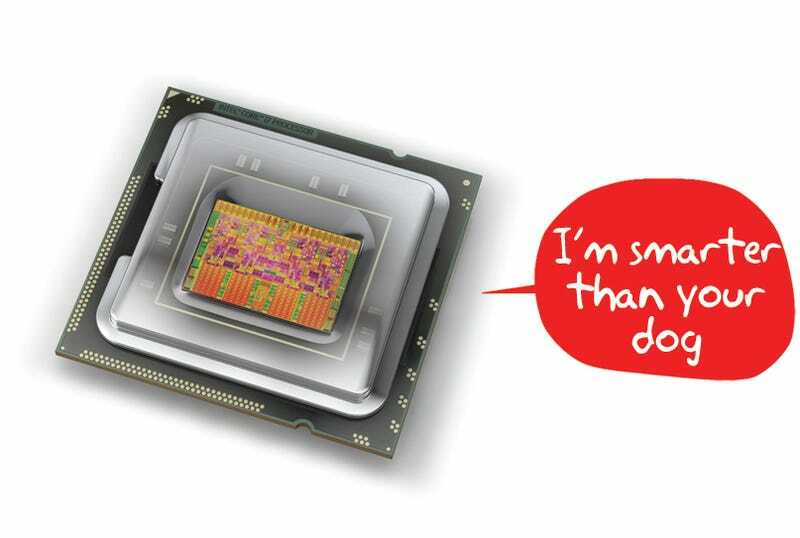 So yeah, Core i7 gets our engines running, and we're not even chip nerds. (Honest!) Sadly though, right now there are just a few Core i7 chips available, and they're all for desktops. There's not much of a downside for portables—save for the need for new motherboards and the DDR3 RAM already used by premium laptops—but before you see it in a Dell XPS notebook or MacBook Pro, you're going to see it in a lot of desktop gaming and graphics-intensive systems. Laptops probably won't appear until way into next year, but we think they'll be well worth the wait. Something you still wanna know? Send any questions about chips, Pringles or the Hillary Swank movie The Core to tips@gizmodo.com, with "Giz Explains" in the subject line.